Protect your valuable tech products with this stylish monogrammed ipad tablet case. Solid faux leather finish with buckle style handles. Three section interior with zipper closure. Includes mini zip pouch 7" x 4". Padded interior section, inside middle divider. Attractive business handbag tech tote bag. 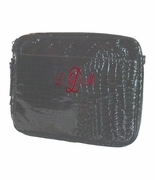 Monogrammed ipad tablet case can be personalized with a three letter monogram or name. Embroidered table ipad case measures 16" wide x 10.5" inches high and 3 inch wide bottom.